One of the biggest and most heart-warming success stories in digital photography has been the Nikon D70. This camera succeeded in combining great looks, fine performance and a tempting price to enable Nikon to regain its rightful place chewing at the heels of arch-competitor Canon. The Nikon D50 takes the formula further, offering a comparable feature count and improved performance in an even more compact and economical package. This pitches the camera headlong into a fray populated by the Canon EOS 350D, Pentax *st DS and Olympus E300. Let's see how well the D50 might do against this field. The camera is available in a kit with the new AF-S DX 18-55mm f3.5- f5.6G ED lens. This makes a very neat, compact package and its rakish lines clearly show its Nikon ancestry. When you pick it up, it's heavier than you'd expect, thus helping to give it a reassuringly solid chubbiness. This marries well with the feel of the controls: firm and positive clicks all round. The front of the body carries a lamp to the right of the lens mount to help focusing in the dark. A switch to the left of the lens mount selects autofocus or manual focus: where a lens carries its own switch one or the other switch is redundant. The one on the body takes precedence so if it's set to manual focus but the lens is set to autofocus, you have to focus manually. A potential source of confusion for new photographers. On top of the body you find the usual DSLR controls: an on-off switch surrounding the shutter button, a display next door with self-timer, and exposure over-ride buttons. The self-timer button changes mode simply by being pressed. Given the button's location, it's too easily done and, because the LCD indication is tiny, it can be overlooked. On the other side of the body, you find the mode dial: meatily designed, with over-large but clearly readable settings. These range from the usual exposure modes of Manual, Aperture and Shutter Priorities and Program, to full default Auto, and six useful special modes for Night-time Portrait, Close-up, Sports and other common situations. These modes determine not only exposure mode but other features too, such as colour rendering. The Child mode, for instance, attempts to bump up bright colours while leaving skin tones as they are. On the rear of the camera, there is a pleasing scarcity of buttons. One disadvantage of being a professional is that you're expected to be able to remember how to use numerous buttons: the Nikon D2X, for instance, sports more than two dozen controls on its back. 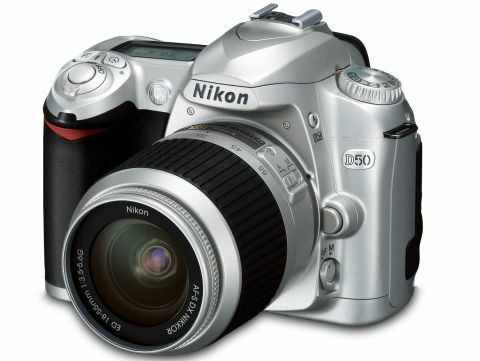 The D50 offers just ten. There's a setting dial for the right thumb, and next to that the exposure/ focus lock. Down the left of the 2-inch LCD screen are the review, menu, sensitivity and review mode controls, plus white balance and lock, zoom and enter buttons. To the right of the LCD is the trash button and a navigation rosette. Finally, a small, snug door on the right slides out to reveal the slot for the SD card. This is better designed than on many Nikon cameras in that you can actually open the door and take the card without needing the finger skills of a pickpocket. On the opposite side, under a rubber cover, you'll find the usual connectors: Video Out, USB and DC power in. Another pleasant surprise awaits you when you lift the camera to your eye: the view is bright, crisply contrasty and looks neutral. This level of image would have done a professional camera proud a few years ago and is superb performance for any camera now. Bear in mind that the lens tested is a relatively slow f/3.5 maximum aperture at the wide end, yet even at the f/5.6 long setting, the viewfinder is a pleasure to use. Indications in the viewfinder are surprisingly complete too, from focus confirmation to warnings of no memory card inserted and preset white balance. In between, you also get exposure settings, analogue exposure display for manual operations, exposure lock and so on. Additionally, you get indicators on the focusing screen itself of the active focusing zone. So, it all looks good so far - but just wait until you turn the D50 on. It responds nearly instantly, leaving some current professional cameras behind in the dust. Shutter lag is very short too: not quite as brisk as top models, but entirely usable. You'd be a very hard-working beginner if you stretched this camera's ability to fire off a series of shots. When you half-press the shutter button, the viewfinder shows how many shots you can take in a series: although the camera said nine, at times I could squeeze off a burst of ten - taking about five seconds - before it needed to take a breath. Then it needs some 25 seconds to recover fully. However, after about three seconds, the camera's ready to take another shot. In other words, this beauty is able to take pictures even as the cache or temporary memory is being emptied. This is a cracking, fully professional feature. Other aspects of handling also deserve high praise. For example, the LCD screen is not only large and clear, it's highly responsive and able to display new images even as the most recent one is being written to memory. The menu items are large and clearly legible, but zooming into the review picture needs careful sequencing between two buttons. Autofocus performance with the 18-55mm zoom is entirely satisfactory: neither the fastest nor the slowest in this class, but working well into low light levels. Images from the camera are marked by two qualities: cleanliness from noise, and good dynamic compression. This means that the images are smooth, with gradations unbroken and changing evenly from midtone to darker tones. Good dynamic compression means that it handles wide ranges of luminance well, resulting in more details showing in highlights while shadow details are also retained. This does have the side effect of making the images look slightly soft or fl at in tone, though. In compensation, midtone contrast is good, so the overall impression of the images is very favourable. This is in part a testament to the lens too, which performs well for its class: images are well drawn, although detail could be more crisply rendered. Overall, when you add up a camera which handles and performs well and which offers all of the essential photography controls with such a low price tag, you have a superb entry-level model. It will easily grow with increasing demands, or offer a perfect back-up for a more comprehensive outfit.